Join us for a rare mainland appearance by Emmy award-winning and beloved new thought singer/songwriter, Faith Rivera. 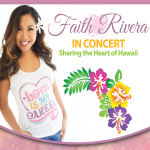 She will share deep, heartfelt, joyful music from most-loved Hawaiian songs to her own originals used by centers worldwide. Come experience the Aloha Spirit through songs and stories including insights from Hawaiian spiritual shamans (Kahunas) whom have shared with Faith about the integral role of Hawaii as the healing heartbeat of our planet. There is something calling each of us to greater aloha, deeper love – tune into that “call” at this special event through Faith’s music that opens the heart and stirs the soul in a way few can.